Global xProducts is focused on co-creating Mobile Devices with rich experiences together with key strategic partners and partner ecosystems, commercializing new experience-based devices and innovating new business models. Previously, Scott was Corporate VP and GM for Motorola's Mobile Devices business in South Asia, where he led a dramatic turnaround of the business. 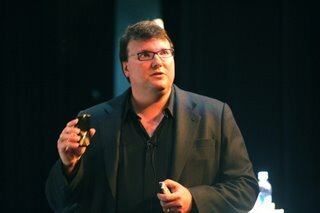 Scott joined Motorola in 2002 as Corporate VP of Strategy and Business Development for the Personal Communications Sector. Jim Wicks is responsible for user interface and industrial design of Motorola personal communications products. 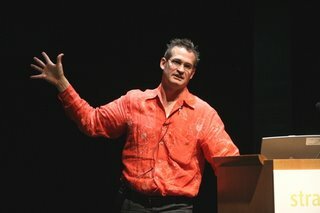 Jim joined Motorola in 2001 as Director of User Interface Design and Human Factors, and functioned in this role until 2004 when he was appointed to his current role. Jim spent many years in Japan, first as a designer for GK Design associates and then with Sony Corporation. He later joined Sony's design group in the US with a focus on personal communications, computing and new audio products, culminating with his establishment of the Sony innovation and design center in San Francisco. Scott, recently made chief of Global Product and Experience Innovation at Motorola, spoke of their goal to make “wickedly compelling” products. And the objectives of simplicity, honesty, richness and surprise in what he called “perceive quality”—the characteristics that make sense to people in terms of quality. He mentioned the importance of linking the design process and innovation cycle to the business cycle. He also talked about the importance of the design of the retail environment and is alignment with the product. He said their current retail strategy is “give me a square foot” as he showed their delightfully small products arrayed on a tray. Jim extended Scott’s strategy formulation: “Lustfully beautiful/wickedly cool” products.